Izzara is a Redguard mage trying to save her sister Adeena from the clutches of Anexiel, a powerful spider daedra found in the ruins of Nilata. Her sister's husband Najan asked her for help but he became even more worried when neither of them returned. 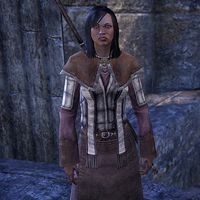 Izzara is considered unusual for her vocation as a mage amongst the Redguards but her talents saw her studying at Daggerfall and Wayrest. Izzara can be found standing within the ruins entrance, she appears to be injured and the door is warded. Najan sent me. Are you all right? "Najan. He finds yet another person to do a husband's work for him. Pathetic. Don't concern yourself with my wounds. The door to the ruins has been sealed by an Ayleid spell key. You must destroy the focus stones protecting it so we can get inside." Will you be safe here? "I thank you for your concern, but I am well-versed in restorative magics. I will recover quickly. Mephala's web grows tighter by the minute. Meet me at the spell key in the center of the ruins once you've destroyed the four focus stones." She can then be asked about the Ruins and her mention of Mephala. "Yes. You appear wise and well-traveled. Surely you have heard of her?" "Mephala is the demon prince of murder, secrets, and seduction. Some call her the "Webspinner." Like a spider, Mephala is always weaving a web of intrigue and terror. Unfortunately, I believe my precious Adeena has been ensnared." So you think that Mephala is behind this? "Directly? No. I doubt that Mephala would take an interest in the affairs of a goat farmer and his wife. But the Webspinner has many servants. A secluded ruin, a foolish, lustful farmer …. Such an opportunity might be hard to pass up." Can you tell me more about these focus stones? "Of course. This ruin hides all manner of secrets. One of which is a "spell key." Three thousand years ago, we might have needed a whole host of mages to break its hold on the door. But now, it's a brittle relic." So the focus stones are keeping it together? "Exactly. The Daedra must have sensed the fragility of the key and empowered the focus stones to protect it. They're something akin to Welkynd Stones, albeit larger and more unstable. It shouldn't take much effort to break them." Is this really as simple as you're making it out to be? "Well, yes, there's the spiders. But I'm sure they'll be no trouble for a hero of your stature. As far as the strength of the ward, the Daedra probably didn't have time to prepare. It may simply be stalling until it can complete its ritual." I apologize for being vague, but every minute we spend talking is another minute that my sister is in danger. I promise you, I'll explain more when you've dealt with the focus stones." Once you have broken the Focus Crystals, Izzara can be met at the Spell-Key. "Ah, you made it. And I sense that the focus stones have been dealt with? Well done, hero." "Now that the focus stones are destroyed, I can deal with this infernal spell key. We should be able to enter the ruins in short order." "As I said before, the spell key is a brittle and aged relic. I'll weave a simple enchantment and that should be the end of it." She will then proceed to cast her spell. Izzara: "Take care, my friend. The spell key is going to become unstable. The effects may be … explosive." Izzara can then be spoken with the find out what must be done next. 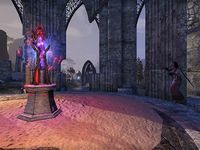 She will then reveal that the Daedra's summoning ritual must be stopped by unbinding the captives from the spell work—which will kill them. "Now—we have some grim business to discuss. I pray that you will have the strength of will to see this through." "It's the ritual. I did not have the heart to speak of it before, but I can't put it off any longer. That fool Najan told me that the Daedra has been abducting people. It is, no doubt, collecting them for a summoning ritual." "Yes. It plans to summon its true form here—to Mundus. It will need living sacrifices to do so. We have to … deprive it of those living offerings." "Please, do not think of it as murder. Look around. These people were dragged below by some of the most venomous spiders in all of Tamriel. The toxins they were injected with … victims do not recover from such encounters." "None. They are beyond help. I beg you to look on this as a kindness. Their souls will find more comfort in Aetherius, I assure you. Take my talisman. It will make it easier. Use it on any victims you find. Be a true hero and set them free." Izzara: "That should do it. We can enter the ruins now." As you progress through the ruins, she will affirm your actions by saying "I know you have the strength to see this through." Once you have unbound the captives within the ruins, you will hear a cry which can investigate. Izzara will recognize the voice "Adeena? She must be here somewhere …." When you find Adeena, she is bound much like the other captives were and Izzara will mention that you must be cautious when you speak with her as she is likely still possessed, "It pains me, but we cannot take her pleas to heart, my friend. The Daedra will try anything. Speak to it if you want, but you know what we have to do." However when you speak with her sister, she will plead that you have been deceived and that it is Izzara who is currently possessed by the Daedra. Izzara will then walk into the room and the pair will argue with each other, with both insisting the other is possessed. "Adeena's the one possessed. The Daedra is trying to trick you. Don't believe its lies." Adeena: "No. You must believe me. You can't let it finish the ritual. You can't!" Izzara: "So long as that thing lives, so does the ritual. You have to kill it to end this!" Adeena: "Please! Listen to me! If the ritual completes, who knows how many innocent lives may be lost." After this both sisters can be questioned before deciding who is the possessed sister. Izzara will argue she had many opportunities to kill you but did not as a sign of her trustworthiness. "We can't wait any longer. She's already free of her bonds! Please, in Ruptga's name, use the talisman and release her!" "Have I not earned your trust? I've had countless opportunities to attack you … to slay you. But I haven't. Did I not tell you that Mephala is the Prince of Secrets? The spinner of lies and mistrust? You are being deceived! You must act!" Is there a way to prove you're telling the truth? "Look into your heart. Have you been wrong this whole time? Is your compass that broken? I don't offer comfort, but I do offer truth. My sister is lost to that thing. It breaks my heart, but we must finish what we started. If you decide that Izzara is possessed and use the talisman on her, she will die and the spectral form of Anexiel will appear over the body and congratulate you for figuring it out. But then she will smugly note that identical twins count as the same person in a summoning ritual before disappearing. However, if you used the talisman on Adeena - the following will happen: needs this branch of the quest play and recorded. Afterwards, Izzara can be spoken with to figure out to do next. This page was last modified on 30 November 2018, at 10:38.